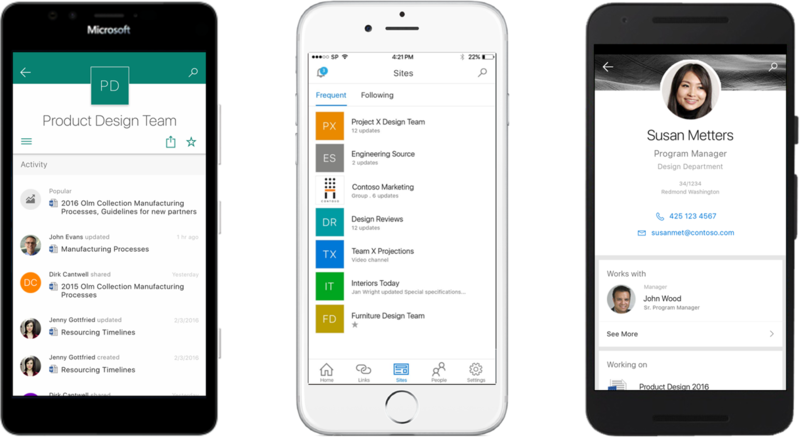 Post has been updated to reflect the availability of the SharePoint mobile app for iOS and provide an up-to-date roadmap for this quarter. Post has been updated to reflect the rollout of the new Site Contents page to First Release customers. The intranet is at the epicenter of many organizations, as the place where employees can get company news and information, plus search for people and content. Now, we will make the intranet a more personalized experience, one that is where you need it, when you need it. Welcome to the mobile and intelligent intranet. Spanning on-premises and Office 365, the mobile and intelligent intranet brings together the productivity of SharePoint Team Sites, the broadcast reach of publishing sites and portals, and the mission criticality of your most important business applications—accessible from your desktop to your mobile phone—and powered by the Office Graph, so information finds you, instead of you having to find information. Today, we announced The Future of SharePoint, which detailed our vision and innovations, including the new SharePoint mobile app, a new SharePoint home in Office 365, modern team sites with Office 365 Groups, responsive page authoring and updates to document libraries and Lists. We also announced SharePoint integration with Microsoft PowerApps and Microsoft Flow. We’re committed to evolving your intranet to be more accessible on the go and more personal, with intelligence-driven content based on your activities across sites, the people you work with and the content you work on. Users can also have multiple accounts online and on-premises, and can easily switch between them. The SharePoint mobile app for iOS, SharePoint mobile app for Android and SharePoint app for Windows 10 Mobile are now available. And a planned future update to the apps will bring company news and announcements to your device. The new SharePoint home creates a space for SharePoint on the web within Office 365 that allows you to quickly find and create sites. And just like the SharePoint mobile app, the SharePoint home web experience enables you to easily find and discover the places, information and people you need to be productive. 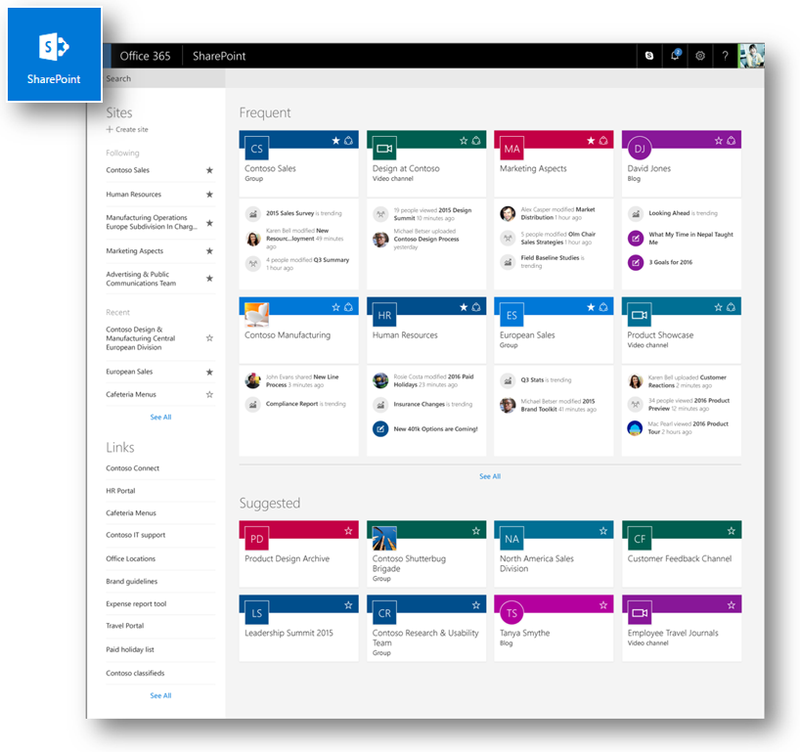 Users simply click the SharePoint tile from the Office 365 app launcher—formally the Sites tile but with the same logo—to launch a redesigned, modern and responsive user experience with intelligence and site activities front and center. Once in your SharePoint home, you’ll see the sites and portals you are most active in alongside recommended sites per the Office Graph and company-wide sites promoted by your company, the entire intranet of an organization. Here, too, is the heart of enterprise search. Start typing in the upper-left search box and you’ll see results intuitively organized, with results visually displayed. One app, one Web, a click and a tap away. The SharePoint mobile app and SharePoint home is your new “gateway” to experiences in SharePoint. Our goal is to make it simple and fast to navigate your entire intranet across any device, so you can keep track of the sites, work and people in SharePoint and Office 365 that are important to you. To learn more about the SharePoint mobile app and the SharePoint home web experience, check out the new Microsoft Mechanics video, “Your Intranet in Your Pocket: The SharePoint mobile app,” with Andy Haon, principal group program manager for the SharePoint engineering team. 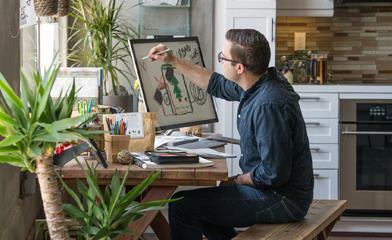 Learn more about how to find sites and portals in Office 365. 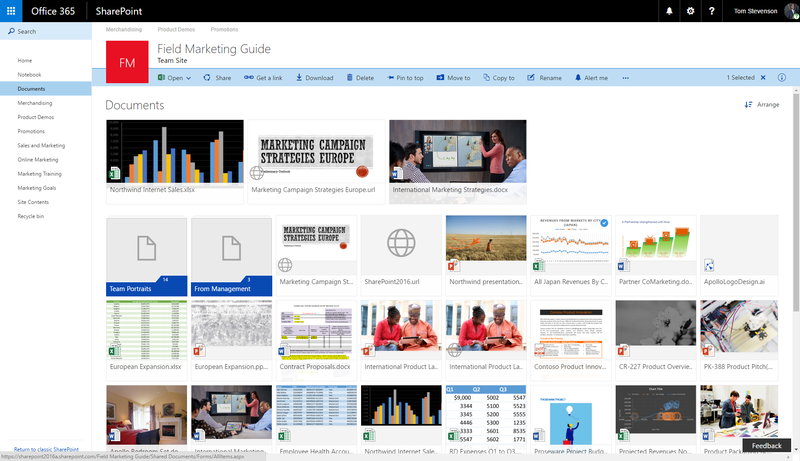 Team sites + Office 365 Groups—First, the updated team site home page is the quickest way to find and showcase the most relevant and important content. Team members can pin the content and news right up front. With intelligence from the Office Graph, team members can view recent people and content activity. The team site home page offers an updated entry point to where team members get work done and is applicable to new and existing team sites. It is now simple and fast for users to create team sites. And by default, every group in Office 365 Groups gets the full power of a SharePoint Online team site. We’ve made huge improvements in the time it takes to create a team site—targeting “seconds-to-ready.” The provisioning flow and integrated value leads to the creation of Office 365 Groups in Azure Activity Directory (AAD), as well as establishing governance and compliance controls for site classification. Modern document libraries experience—The second aspect, the true heart of team sites, is the document library, a secure location to create, share and organize team files. This update builds on the core value people have come to depend on for years, adding a new user experience and capabilities, designed to bring consistency for working on files throughout Office 365 while maintaining the full power of SharePoint document libraries. We focused on helping your team get to work right away and highlight what is most important. Use Pin to top to increase visibility and discoverability for important documents, videos and more at the top of the document library for all users. You can also add a link in an Office 365 document library to an item that is located outside the document library. For example, you can add a link to a file or folder located in a different document library or website. When you add a link in a document library, the link shows up in the list of items in that library with a web globe icon to identify it as a linked item. To help you find and manage items, you can now sort and filter columns. In addition, new, real-time full-text search results appear directly in the document library experience along with quick, inline metadata management. And finally, when the team needs to bring in files from OneDrive for Business or publish files between document libraries, users can click Move to or Copy to move or copy files to other locations across Office 365, without generating unnecessary versions of the same files. The new modern document library experience, showing two documents and a link pinned to the top. Learn more about how SharePoint Online document libraries have been updated. Modern Lists experience—And what about managing structured data in SharePoint Online Lists? Over the years, customers have used Lists for everything from tracking engineering bugs to managing event sessions or even to cataloging the t-shirt sizes of everyone on a team, making Lists a key tool for sharing data and building lightweight processes. We’re excited to share that Lists are also getting a visual refresh, aligned in look and feel to document libraries. The core value and power of Lists goes unchanged. This update to SharePoint Online Lists brings a new user experience, aligned to the look and feel to new modern document libraries experience. You’ll first notice an updated top with quick actions for commonly used Lists tasks. Lists are much more mobile friendly via modern mobile browser across devices and a great experience when navigating Lists via the new SharePoint mobile app. Integration with Microsoft PowerApps and Microsoft Flow coming—We are also excited to announce integration plans with Microsoft PowerApps and Microsoft Flow (announced last week); both are planned to be built right into SharePoint Online Document Libraries and Lists—helping automate your teams’ processes—especially while on the go. It’s a great way that SharePoint can be connected to a world of data sources without great cost of time or development complexity. 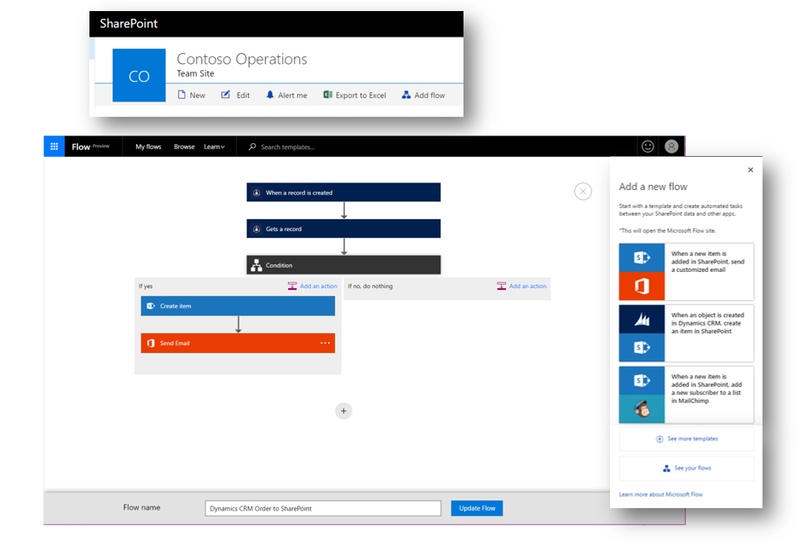 The Add flow button within a SharePoint Online List takes you to Add a new flow and into Microsoft Flow designer. Beautiful, modern pages experience—The mobile and intelligent intranet pivots on modern page creation to create multimedia content, like a trip report or information about a new product launch information, using a fluid, inline and responsive page authoring experience. Pages are a great way to communicate and to assemble information from a variety of sources. We updated the page authoring experience to make it effortless to add simple content and powerful web parts. The pages you create can be shared and are part of Office Graph, so users can more easily discover your pages. And our modern pages render beautifully on screens of all sizes. SharePoint will modernize published portals and pages with a new responsive design that can run in the web and the new SharePoint mobile app. This will include simple branding, page layouts, editing and video support built on Azure Media with extensibility through modern web parts covered below. Now, every team site comes with the ability to quickly build out and publish professional, polished reports and pages. Modern pages area easily created in your browser when you click Add a page within a team site. 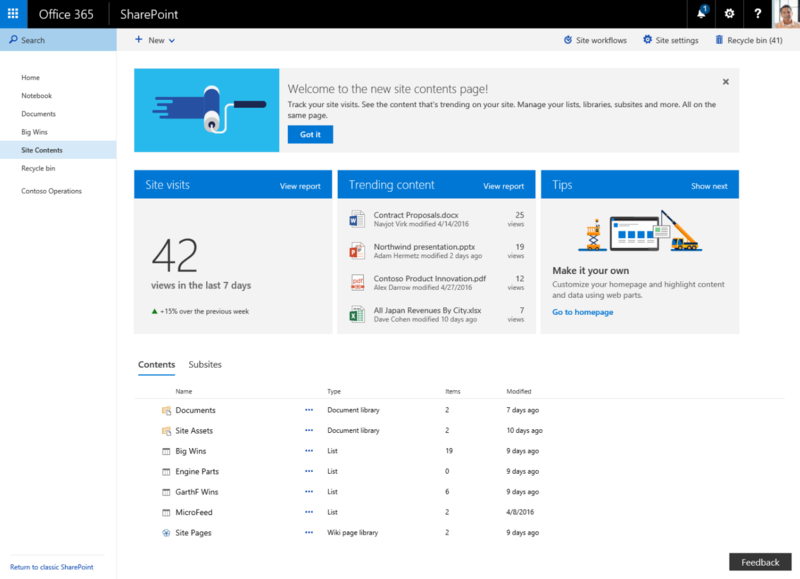 Site activity and insights on the Site Contents page—The SharePoint Online Site Contents page is being redesigned to help site owners, members and visitors understand the activities occurring within the site. The Site Contents page will provide visibility on top-viewed content and a site map, and will offer users site tips. Think of this as site-level activities and analytics. The new Site Contents page will also provide clear access to add lists, document libraries, subsites and apps. New quick buttons will allow access to common actions and deeper site settings. Updated Site Contents page in SharePoint Online showing Site visits and Trending content. Learn more about the SharePoint Online Site Contents page. As you can see, our team has been busy creating exceptional new experiences that empower you work effectively across your intranet—from very personal experiences with the people and content that matter to you to rich and responsive team sites and applications, all the way up to collaboration and content management across the organization. Modern document library experience (in production now). SharePoint mobile app for iOS (available now in the Apple App Store). 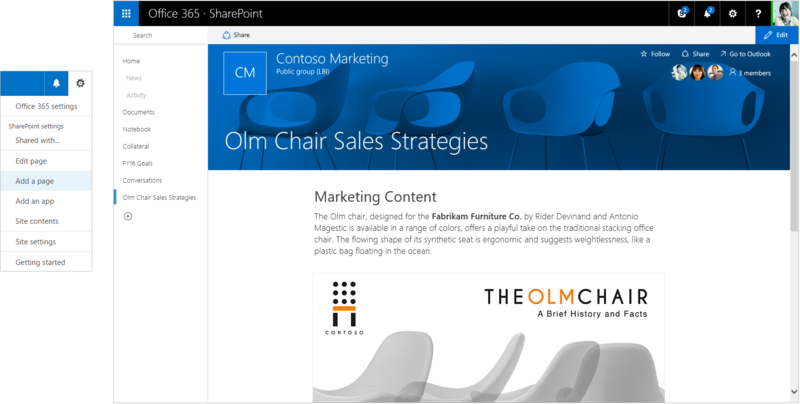 SharePoint home in Office 365 (in production now). Site activity and insights on the Site Contents page (in production now). Nine out of 10 intranet design award winners selected SharePoint as their chosen platform (Nielsen Norman Group 2016 Intranet Design Awards). As you consider updating and expanding your intranet, we know SharePoint will be an important element to support you and your teams into the future. We welcome feature requests and feedback via the Office 365 UserVoice, @SharePoint and @Office365 on Twitter, and in the comments below. We’re eager to hear your feedback and use it to provide the best experience possible. Q. 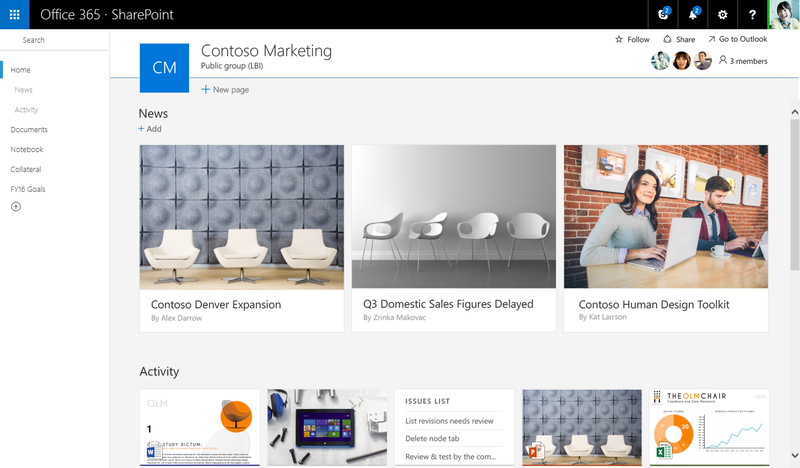 What mobile platforms are planned for the new SharePoint app and when can we expect them? A. We are building the SharePoint app for Windows, Android and iOS. We will ship the SharePoint app for iOS by end of the first half of 2016, followed by Windows and Android versions by end of the second half of 2016. A. Yes. The SharePoint app will connect to your environment whether you are using SharePoint Online in Office 365, SharePoint 2013 or 2016 on-premises, as well as with hybrid deployments. Q. When and how can I expect to see the new SharePoint home in Office 365? A. We will begin rolling out the new SharePoint home page within the next few weeks, initially to First Release customers and then into the worldwide production environment. Once the new SharePoint home is available to an Office 365 customer tenant, the existing Sites tile in the Office 365 app launcher will become the SharePoint tile and the main, top-navigation will say Office 365 > SharePoint. Q. Will every Office 365 Group get a full SharePoint team site? A. Yes. When you create a new site from SharePoint home, you are asked to give it a title, assign the proper form of usage classification and assign appropriate members. When you add members during site provisioning, you are creating a new Office 365 Group into the tenant’s Azure Active Directory (AAD). Existing Office 365 Groups will also get a full SharePoint team site. Q. Can I adjust the default experience for SharePoint Online document libraries from new or classic and back? A. Yes. To learn more from a user and an admin perspective, please review this Office Support article.